A third version of 2016's Pokémon Sun and Moon drops today for the 3DS, so you may be wondering what, exactly, has been changed this time around. Should you play Ultra Sun and Moon if you already enjoyed the original games? If you’ve never played any version before, is this the best game to get? I’ve beaten Ultra Moon, and can say that a good chunk of Ultra Sun and Moon is similar to the initial installments. That’s not a bad thing: Sun and Moon are wonderful Pokémon games full of smart design choices and charm. You still play as a young kid undergoing a monster-fighting challenge in a tropical paradise. Instead of gyms, you take on a series of surprising “trials” where battling prowess is not the sole factor determining your success. The islands where everything unfolds have such a unique ecosystem where many monsters have a unique “regional variant” that reinvents many classic pocket monsters. Mysterious “Ultra Beasts” from a different dimension are still in the mix. All the previous improvements are still here: You can call a special Pokémon at any time to fly you around, or surf through the water. You can read our original review and get a good sense of how these game work and what makes them so good. This is a rough estimate, but I’d say around 85% of Ultra Sun and Moon will be familiar to anyone who has played the first game. 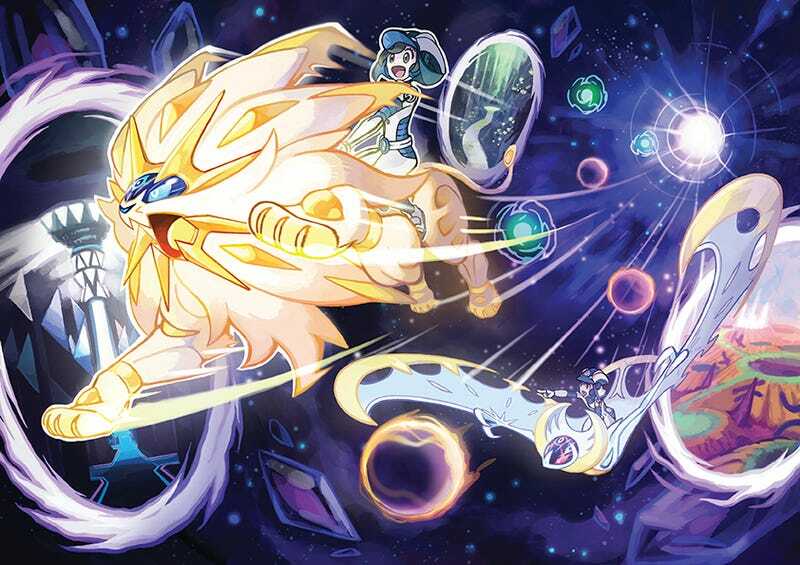 Like many third Pokémon games before it, Ultra Sun and Moon are enhanced versions with a handful of new additions, tweaks, and small refinements. Here are some of the specific changes I noticed while playing. While the structure of Ultra Sun and Moon remains the same, the larger threat has changed. This time around, legendary Pokémon Necrozoma, a monster hailing from a different universe, threatens to destroy everything you hold near and dear. This in turn changes some of the tale surrounding Guzma and Lusamine, who aren’t exactly villains this time around. Granted, you won’t see the bulk of these differences until late in the game, when the story takes a major turn. Otherwise, along the way, you’ll also have to fight some new battles against an “Ultra Recon Squad” who are somehow tied to Necrozoma. Certain scenes and scenarios have been edited to be punchier, so you’ll get to the action a bit quicker. There’s still a lot of unskippable dialogue and the like, but you’ll be spending a lot more time in battle. I can’t believe the original Sun and Moon didn’t have this. Very useful. Creatures from other games will appear in Alola this time around, and more importantly, every legendary can be captured in Ultra Sun and Moon. As usual, though, what you can capture is limited by version exclusivity, so you’ll have to make some trades to catch ‘em all. If you want a handy list of exclusives, Serebii has you covered. You can take pictures with your buddies now, complete with special borders for your photographs, stickers, and special poses. It’s fun to use, and I’m really looking forward to seeing what silly pictures other players take with this mode. The more you play, the more borders you can unlock for the mode. Not only does your Pokedex talk and ask you questions from time to time, it can also reward you with special power-ups that help you in battle. Rotom can help you gain more experience, more prize money, or recharge your PP. Having these extra bonuses is a welcome change. Expect more characters to ask you to show them certain Pokémon, do fetch quests, or to visit certain areas for money. Since all of these quests are unmarked, it felt gratifying not just to complete them, but to remember they exist at all. Ultra Sun and Moon introduce a surfing mini-game where you can use the control stick to perform tricks and cool moves with a Mantine for points. The more points you get, the more “BP” you earn, which you can trade in for useful prizes. It’s a neat idea that fits in with the wider theme of the game, but I found the controls kinda cumbersome on the 3DS. Guiding you along your journey are “Totem Stickers” that you can collect, all hidden around the main story path. It’s surprisingly addictive to seek these stickers out, especially once you can start using them to redeem Totem Pokémon from Samson Oak. Yes, the Alola version of Professor Oak actually has something to do this time around! New to Festival Plaza is the “Battle Agency” where you can rent monsters to fight against enemies. You can team up with other players, and the more people you connect with, the more powerful monsters you’ll be able to rent. Once you beat the game, a new segment opens up where you can take on a super group of super villains called Rainbow Rocket. Here, you fight against 20 years of major Pokémon enemies in what makes for one of the most exciting post-game additions to the series in a long time. While it’s disappointing that there are no more Alola variants, there are a handful of new powerful monsters you can collect—including, of course, the new legendaries on the cover—and a few new Ultra Beasts. Your trainers can look a little different now, and I also spotted some new threads available for purchase in various shops. You can think of Ultra Sun and Moon as the Director’s Cut of this generation of Pokémon. If you haven’t jumped into the latest Pokémon games yet, this is absolutely the place to start. If you’ve already played the original games, Ultra Sun and Moon is a tougher sell, especially on a jam-packed year like this one. I found going through so much of the same game over again to be a slog, but things picked up a couple of dozen hours in. I imagine collectors who want to own everything, along with competitive players who want to build the best teams, will want to check Ultra Sun and Moon out no matter what. Ultra Sun and Moon is not an essential experience if you’ve already played the first games, but they still showcase a better, more-refined version of Sun and Moon.